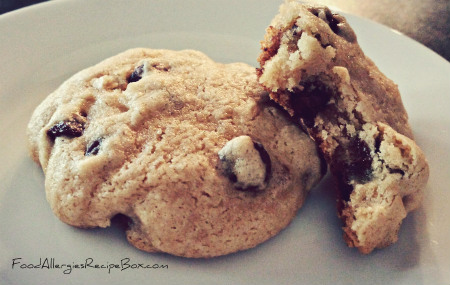 Easy Chocolate Chip Cookie Recipe! This easy chocolate chip cookie recipe is absolutely delicious and best of all it's also free of the top 8 most common food allergens. One thing that has always bothered me about baking allergy safe treats is the long list of ingredients needed to create anything. This is one of the many reasons I love this recipe. It was basically created because my pantry was pretty bare and I had a major craving for something sweet! Nothing reminds me of my childhood more than chocolate chip cookies. They were a staple dessert in my household. My mom and grandma used the same recipe, but mom's cookies always came out fluffy and grandma's were more chewy. Each amazing in it's own way! Unfortunately, that recipe calls for wheat flour, eggs, and butter. All of which are now on the, "can't eat that anymore" list. I have yet to find an allergy safe cookie that could stand up to the ones of my childhood. Until now! Honestly, I was amazed at how similar these cookies are to the ones my mom and grandma used to make for me. Finally, an allergy safe cookie, with only a few ingredients that tastes amazing! I'm in heaven with this new discovery. It does nothing for my goal of getting into a bathing suit this summer, but too bad because they are just so darn tempting, especially fresh out of the oven with a tall glass of cold rice milk!! I truly hope you enjoy this delicious and easy cookie recipe as much as I have! Share your thoughts with us and join our online community on Facebook! What's your favorite cookie? Mix brown sugar, oil, vanilla, and salt until combined. Next add flour and baking powder. Begin combining the wet and dry ingredients while adding the milk. Continue mixing until all ingredients are well combined. The dough will be firm, but sticky. Don't forget to add the chocolate chips! Line a baking sheet with parchment paper and spoon the dough onto the sheet. I recommend using two spoons to scoop dough onto baking sheet because this dough is pretty sticky. Bake at 350 degrees for 12-14 minutes or until golden brown. This recipe makes about 24 cookies. Looking for more yummy dessert recipes? Check out our dessert recipes home page! Return From Easy Chocolate Chip Cookie Recipe to Food Allergies Home Page!